I’ve got a weakness for bread, cheese, garlic and a grill. This bread has all that and more. It’s the garliciest, cheesiest, gooiest riff on garlic bread I’ve ever had. I’ve been making this for parties and to take to friends’ houses for BBQ’s for as long as I can remember. I think the original recipe came from one of these little booklets you can pick up at the grocery store checkout counter, but I’m not certain. In any case, I’ve modified it enough so that it’s mine now. 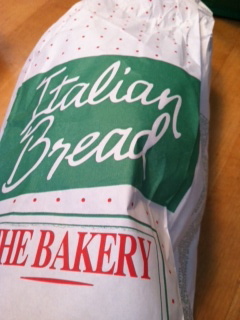 Start with a large loaf of Italian bread, the kind in the paper sack in the grocery store. You don’t want anything too dense…light-textured bread is best. One of the secrets is in the cutting – you don’t cut straight, even slices. You start at one end and cut on a diagonal all the way across the loaf. Then, you turn it around and do it again the other direction. Do not cut all the way through the bread – it should be about a 3/4 cut through and the bottom should remain intact to hold the entire loaf together. The filling is the other secret. I sometimes change it up, but this is my favorite. I use an entire tub of spread margarine, softened a bit. 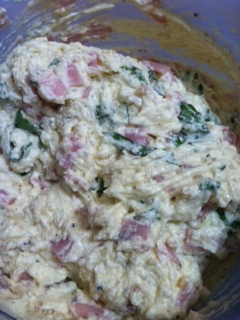 Add some of that already chopped up garlic, some grated parmesan cheese, ground black pepper, diced ham and fresh chopped basil. Mix it all together, taste and add more of anything you think it needs. You’ll want a few layers of foil on the bottom so it doesn’t burn. 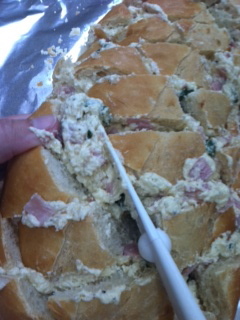 Place the angle-cut bread on top and start slathering the butter mixture into every cut and cranny. Be generous. Depending on the size of your bread you may not use all of the butter. But try! 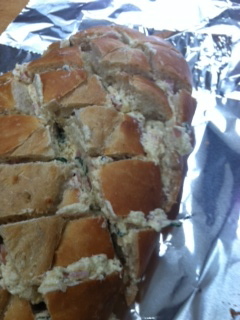 Wrap the foil around the bread and when you’re ready to grill it, place it directly on the grill over indirect heat. Once it’s done to your liking, carefully remove the foil-wrapped loaf from the grill and set it on a heat-proof surface. Now for the best part: the eating. Open the foil and let the steam escape for a minute or two…I know, it’s hard to wait with all that cheesy goodness staring up at you! When it’s cool enough to touch, grab a hunk of bread and pull it off the loaf. You’ll be in heaven from the first bite. PS. I tried to get a photo of the finished product, but it was torn apart and devoured too quickly.